Buy Undercrown Sun Grown Cigars Online! 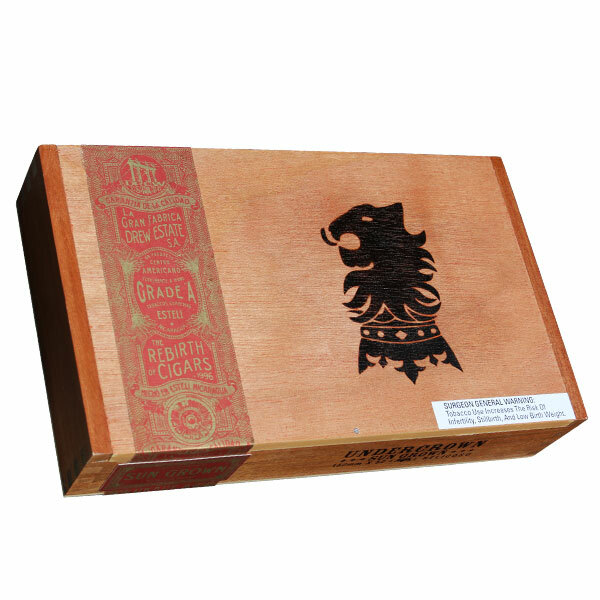 Beginning as a San Andrés-wrapped version of Drew Estate's prestigious Liga Privada cigar, Undercrown was created by Drew Estate's own factory workers, after they were informed they could no longer smoke Liga cigars freely (due to limited availability of certain tobaccos in the Liga Privada blend). The affordable maduro blend saw its first followup in 2015, as Drew Estate unveiled a softer, more mellow version of the cigar with Undercrown Shade. And in 2017, the Undercrown family expanded once more, splitting the contrasting profiles of the former two cigars with the medium-bodied Undercrown Sun Grown. Keeping with the tradition of Undercrown's original conception, the updated Undercrown Sun Grown is said to be blended, in part, by members of Drew Estate's "factory floor" team. These workers paired with Master Blender Willy Herrera, using the same "T52" binder from the original Undercrown Maduro cigar. But the cigar gets its name from its unique wrapper, which hails from Ecuador, showcasing Sumatra seed and grown with full exposure to the sun. Finally, the cigars use an all-Nicaraguan filler recipe, bolstered by a heavily aged ligero leaf from Nicaragua's Nueva Segovia region (said to provide an interesting kick of strength and sweetness). Rather than materializing as a simple "Habano version" of the popular Undercrown series, the Sun Grown is a unique beast all its own. The cigar offers a medium-plus body and rich/tangy characteristics of cinnamon, mineral, browned butter, toffee, salt, zesty cabinet spices, and much more. Throughout 2017, the Undercrown Sun Grown received multiple accolades, topping the list with a No. 1 Cigar of the Year ranking by Cigar Dojo.